Find us an old drum and I’ll sing the Raven Dance for you and you put this on and dance. 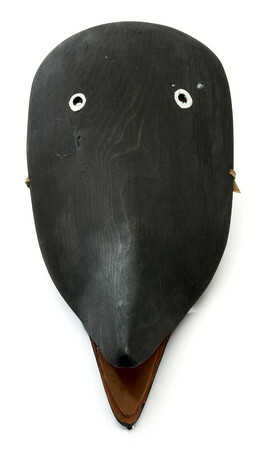 This contemporary Raven mask, made by Aloysius Pikonganna in 1975, is the type worn during the King Island Raven Dance. Ravens are revered and never killed because they “take care of people” and alert hunters to the presence of live game or of dead sea mammals on the ice.